Everyone loves long, sleek straight hair. But, maybe you were not born with it. I know I wasn't. I was born with slightly wavy but annoying frizzy hair that gets poofy and buoyant the minute the weather turns slightly humid. I will kill to have either really curly hair that looks gorgeous or sleek, straight hair that looks gorgeous. The primary I've done before with spiral permanents and I would sit in the chair for hours while they rolled my hair in rods for the spiral perms. I am not doing that again. Besides they are out of style. Now what is in is sleek hair that is long and gorgeous. Usually you have to pay hundreds in a salon to get hair like this however ENVIE has a new kit out that lets you do it in the comfort of your own home for a fraction of the price. I actually used two kits because my hair is so long. That still saves me a few hundred dollars actually. Now, to do the ENVIE Home Hair Straightening System, follow the following directions. 1. Wash hair twice using the ENVIE Clarifying Shampoo. Rinse thoroughly and minimally towel dry hair, so it is not dripping wet. Comb out or brush afterwards. 2. Apply Step 2: ENVIE Straightening Agent. Pour contents of Straightening Agent bottle into a small bowl. starting at the bottom back of head, part hair using wide tooth comb 1"-2" depending on hair thickness. Use hair clip to hold additional hair out of the way. Using coloring brush, brush on Straightening agent from root to tip. After applying comb the section several time to evenly apply it throughout the hair. Then move to the next section until entire head has been done. 3. Wait 20 minutes before moving to the next step. DO NOT RINSE OUT THE STRAIGHTENING AGENT. During the waiting period, approximately every 5-6 minutes, run the wide tooth comb through the hair to make sure You have evenly distributed all of the agent throughout the hair. 4. Blow Dry Hair: DO NOT RINSE OUT THE STRAIGHTENING AGENT. Dry the hair as much as possible using a roller or paddle brush. The hair will feel heavy and damp. 5. Flat iron hair taking care to use small sections at a time (about the width of a quarter) After flat ironing, each section brush that section of hair. 6. Wait 20 minutes before moving to the next step. 7. 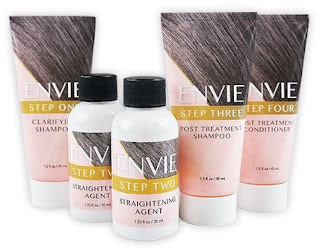 Wash hair thoroughly with Step three: ENVIE Post Treatment Strengthen Treatment Shampoo and rinse hair thoroughly. 8. Apply Step 4: ENVIE Post Treatment Conditioner. Let sit in hair 3-5 minutes before rinsing out. Rinse out conditioner and then remove all excess water from hair by towel drying. 9. Blow dry hair using a roller brush or paddle brush. You may want to apply a thermal protection spray to the hair to protect it from heat damage. Then flat iron hair. With this system you can style your hair straight or have a controlled curl. Here is what you can expect. For a tight looking ringlet curl, use a hot curling iron. For a loose curl, blow dry hair and and use hot curling rollers for loose wavy curls. For a larger curl, rolle our hair in large round rollers and blow dry with rollers in hair. The curl is temporary and will wash out in your next shampoo. ENVIE usually lasts about 90 days on a woman's head and does not just grow out like a straightening system from the salon. It does not change the molecular structure of the hair either. For best results, keep hair damp during application and make sure all of the hair is covered during application. Please follow directions as closely as possible. Frequent exposure to salt water pools, chlorine, or swimming in the ocean might leach the active ingredients in the hair shaft. The more frequently the hair is washed with a high pH shampoo and conditioner the more rapidly that the active ingredients will wash out of the hair shaft. They recommend the ENVIE STAY STRAIGHT Shampoo & Conditioner. These have been developed to work with the system. After the first wash you may need to quickly flat iron your hair every time but only quickly. For $54.99 you get the ENVIE Kit plus the Shampoo & Conditioner. That is a great purchase. The shampoo and conditioner are $12.99 each or $19.99 together. I loved the way my hair turned out. It has been straight for about 2-3 weeks now and I love how it looks and acts. In the morning all I have to do is brush it and I am done. It helps keep out the tangles in my hair which drove me nuts before when it was wavy. I do flat iron my hair if it is going to be humid out. Otherwise I don't really need to do it. I definitely needed two kits for my long, thick mane. The only thing I didn't like was that the kit asked for a haircolor brush but did not include it in the kit and that is not something that everyone has lying around. So, prepare yourself to purchase a cheap one at Sally's or do without. Not many hair color kits come with them these days. If they are going to ask you to use it they should include it. The idea of a small bowl is no big deal, I have plenty of small bowls I could use. ENVIE Home Hair Straightening System retails for $34.99 and can be purchased here www.enviehomehaircare.com.